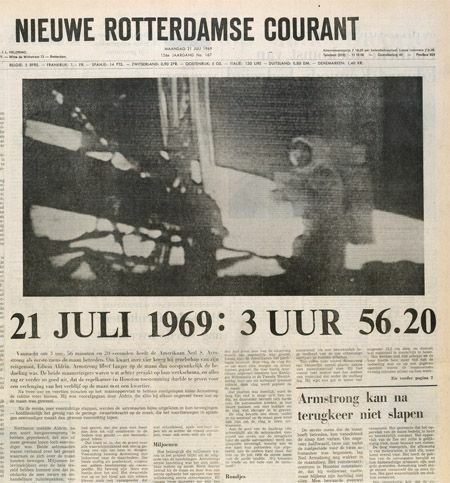 Although the moon landing was years before I was even born, I always had an interest in the space race. The fact that the Omega Speedmaster Professional was the first watch worn on the moon, probably has a role as well in that interest. Last year, when we celebrated the 39th anniversary of the moon landing, I wrote an extensive blog post on the moon landing, NASA and the role Omega played in it with their Speedmaster Professional watches. This year, to celebrate the 40th anniversary of the moon landing, Omega introduced the 40th anniversary Speedmaster Professional watch during the BaselWorld 2009 expo. After seeing it in the flesh, I wasn’t very enthusiastic to be honest. The red tip at the chronograph second hand is too loud to my taste. The sterling silver Apollo 11 patch in the 9 o’clock subregister is very nicely done though. However, this is ofcourse not the watch that is similar to the one that landed on the moon in 1969. 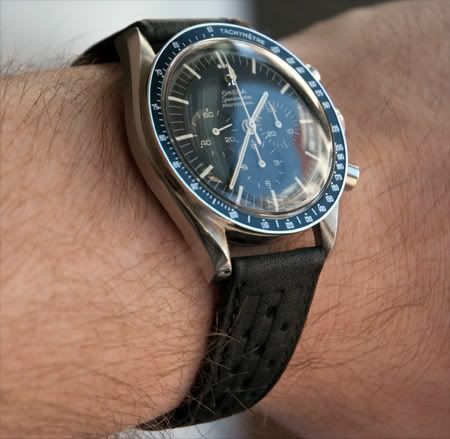 As written before, the Speedmaster Professional watches with reference numbers st105.003 (Aldrin), st105.012 (Armstrong) with serial number 24002981 and st145.012 (Collins) with serial number 26552506 were the first watches worn on the moon, all with movement caliber 321. If you want something modern but yet similar, I suggest you get the regular Speedmaster Professional watch with hesalite crystal and stainless steel caseback (not the transparent one that is), ref 3570.50. 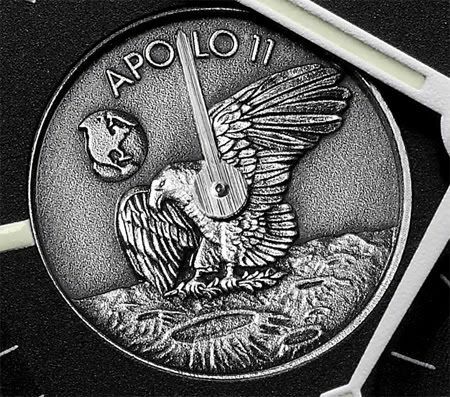 Milking out the moon landing to market a new limited edition Speedmaster every 5 years (and other limiteds in between) has become a bit sad, and I think I am not alone on this one. If you are going to spend 3850 euro on the Speedmaster Professional 40th Anniversary edition, you can actually better spend it on a REAL moon watch, like the aforementioned 145.012, 105.003 or 105.012. These vintage beauties with movement caliber 321 (column wheel chronograph manufactured by Lemania) can be had for 2500-3000 Euro in good condition. Some years ago, I wrote this article about the different Speedmasters through the years (1957 till modern models) and how to identify them correctly. It might be useful when looking for a vintage Speedy. 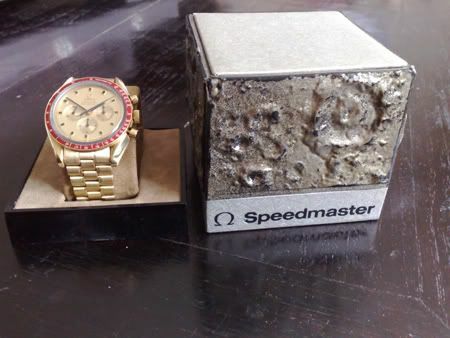 My friend Chuck Maddox, has written excellent articles about these vintage Speedmasters and was an absolute space freak himself, one of the articles which is definately a classic is the one that tries to definatley answer the big ‘which watches have been worn on the moon’-question. You can read the entire article by clicking here. Although I am not wearing my vintage Speedmaster Professional 145.012 on a daily basis anymore, it does get wrist time at times like these, to commemorate the moon landing in 1969. I also think this watch is one of the nicest chronographs around, even nicer than, let’s say, a Rolex Daytona for example. However, for the Rolex fans there is the GMT-Master ref.1675 that is known to be the favorite of astronauts in their private/spare time. As the Speedmaster watches were official NASA equipment and had to be returned, the Rolex GMT 1675 was the way to go for most astronauts. The Speedmaster is one of the purest chronographs around in my opinion, an incredible readible dial, bulletproof handwound movement, a plastic crystal that magnifies the superb dial and – ofcourse – an incredible history. NASA did only choose official for the Omega Speedmaster Professional after running several exhaustive tests. Oh yeah, if you want to take a peek at one of the most special Speedmasters around, make sure to check out the gold Speedmaster Professional that was produced between 1969 and 1972. Only 1014 pieces were ever made, with a box in the shape of a moon rock. The one below is owned by a friend of mine, who proudly wears it! I covered this rare Speedmaster in this article last year. The first 28 pieces were given to the president of the United States (Richard M. Nixon at the time, who received number 1), the vice-president and the active NASA astronauts.